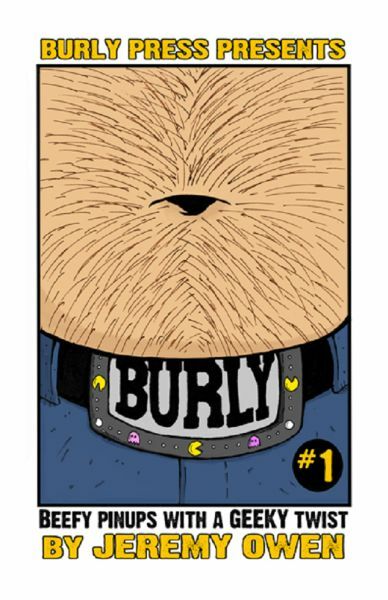 If variety is the spice of life, then I must consider myself suitably seasoned for being able to present this bear-filled comic after a run of magical twinks and super-powered blonds: Newcomer Jeremy Owen’s Burly is a collection of bear-themed, black & white illustrations, set in often geeky situations. 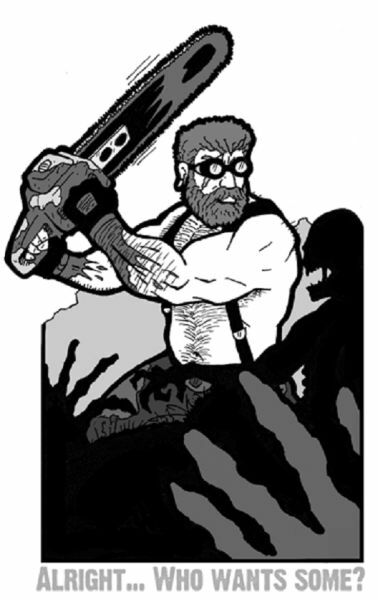 You get horror, sci-fi, adventure, the odd superhero, whether from video-games or films, each with one of Owen’s signature large-bodied, hairy characters. Makes one feel like being in winter in front of a dying fire. Because those cuddly guys would come in handy then. Owen’s art is very solid, with its thick lines and effective use of blacks and whites. The funny titles/comments below each illustration add to the relaxed ambiance. Jeremy Owen is obviously talented in his single-minded pursuit of the perfect bear. I must say I’d now like to see illustrations with two bears instead of just one. Hint hint, nudge nudge, Jeremy. You can buy this comic from the artist, where you can see a preview of the illustrations.